Pulpo gallego. Man, is this good! I can’t tell you when I first ate this Spanish classic, but it was probably sometime in my late teens, and probably at a Spanish restaurant on New Jersey’s Route 22 whose name escapes me now. But I remember it being real-deal Spanish — or at least what I imagined it might be, considering I’ve never been there. Pulpo gallego is basically an octopus salad. Most octo-eating cultures have their versions, and the Spaniards are no different. 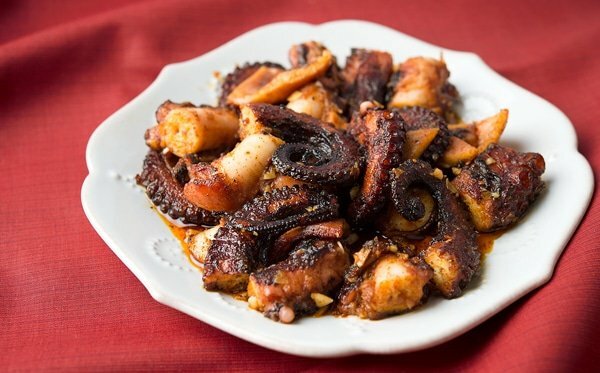 According to the late, great cookbook author Penelope Casas in her The Foods and Wines of Spain, “a la gallego” is anything cooked with paprika and olive oil… to my mind, everything is good with paprika and olive oil, but octopus is especially good. And while most octo salads are summertime fare, pulpo gallego works in any weather. I think it’s the paprika and garlic that gives you a warming feeling when you eat it. Since this recipe is good either warm or at room temperature, and because it keeps for several days, it is a perfect make-ahead recipe for parties or whatever. I like dipping into a stash of pulpo gallego while watching TV; it's perfect to munch on with good, crusty bread. 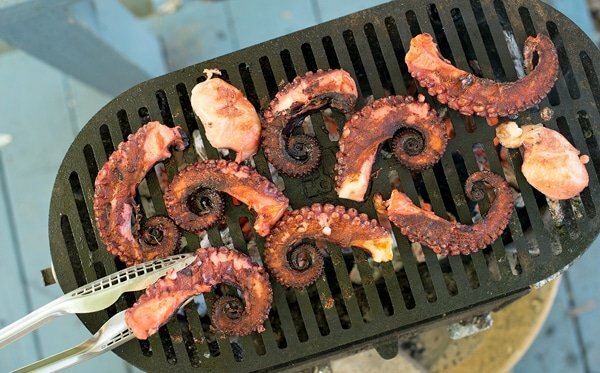 You'll note that my method of cooking octopus does take a while, but it's the best way I know to concentrate the flavor of octopus while at the same time tenderizing it. First you'll need to tenderize the octopus. Boil a large pot of salty water. Cook the octopus for 2 minutes, then remove to a cutting board. While the octos are cooling turn the oven to 225°F. Line a heavy, lidded pot with the parsley, fennel fronds, oregano, green onions and bay leaves. Trim fatty bits from the octopus and clean out the heads (normally this last step has been done for you, but not always). Cut the octopi into large pieces and nestle into the pot of greens. Cover the pot and cook for 90 minutes to 4 hours, depending on how large and tough the octopi are. I typically shoot for 2 hours. Don't worry about the lack of liquid in the pot: The octos will release enough to make a flavorful broth. When the octopus is tender, remove from the pot and cut into serving-sized pieces. Coat with some of the olive oil and either grill or broil until you get some char marks, about 8 to 10 minutes. Toss the octopus with the rest of the olive oil, garlic, the paprika, smoked paprika and cayenne. Add salt and black pepper to taste and serve with lemon wedges, at room temperature or slightly warm. Serve with bread. 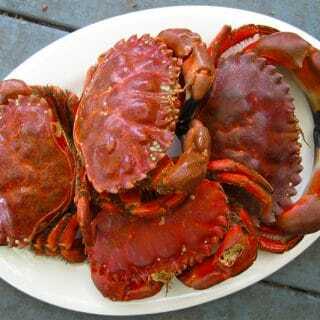 You’ll find more recipes for octopus, squid, crab, shrimp and other seafood right here on Hunter Angler Gardener Cook! I’ve never cooked octopus before. Are you using the head too or just the legs? Is there an optimal size octopus you suggest trying to buy? Thanks. Lillian: Yes, I use the head, too. No optimal size, but the larger the octo, the longer it will take to get tender.